New book is a crucial intervention in the ongoing debate around digital activism. The most controversial activist organisation of the 21st century, WikiLeaks has attracted strong, divergent opinions from across the political spectrum. Lauded by its supporters for its indispensable role in holding governments, corporations, and human rights abusers to account, its advocates and journalists have been excoriated by opponents as traitors, threats to legitimate governments, and misogynists. Yet so much media attention is focused upon founder Julian Assange, and his ongoing confinement in the Ecuadorian embassy in London, that the broader dimensions of WikiLeaks are rarely aired. Especially critical in these omissions is the role of women, both in the organisation and the more general struggle for information freedom. 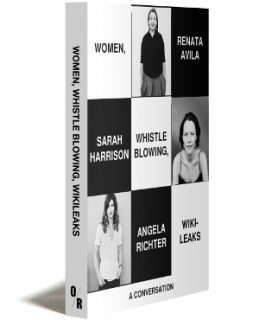 A new book with the title ‘Women, Whistleblowing, WikiLeaks’ presents a conversation between three advocates who have been at the forefront of such activity: acclaimed journalist and human rights advocate Sarah Harrison; Croatian-German theatre director, activist and author Angela Richter; and Renata Avila, a celebrated Guatemalan human rights lawyer and digital rights expert. Their book is a crucial intervention in the ongoing debate around digital activism. It covers topics from the dishonesty of the mainstream media and its contrasting treatment of Edward Snowden and Chelsea Manning to the terrifying monopolisation of personal data under tech behemoths such as Facebook and Google. Renata Avila is a Guatemalan human rights lawyer and digital rights expert. She has played a central role in the international team of lawyers representing WikiLeaks founder Julian Assange and his staff. An access to knowledge activist, she is on the Board of Creative Commons and is a trustee of the Courage Foundation. A former researcher with the London-based Centre for Investigative Journalism and the Bureau of Investigative Journalism, Harrison left to work at WikiLeaks during the height of its ground-breaking publication of US military and State Department documents in 2010. She is also a co-founder of the Courage Foundation. Angela Richter is an acclaimed Croatian-German theatre director, activist and author. She founded the Fleet Street Theatre in Hamburg in 2001, and was house director at the Cologne National Theatre, Schauspiel Köln, from 2013 to 2016. Her interest in WikiLeaks led to the 2012 theatre piece ‘Assassinate Assange‘. In 2015 Richter staged the large scale transmedia-project ‘Supernerds’ in co-production with German national TV WDR, dealing with mass surveillance. The text was based on conversations with digital dissidents and whistleblowers, such as Edward Snowden, Daniel Ellsberg and Julian Assange. Supernerds received the Eyes and Ears Media Award, was nominated for the SXSW Innovation Award in Texas, and is nominated for the BANFF Award in Canada. ‘It’s been striking to me that, in my years of working in the world of digital activism, from WikiLeaks to a diverse range of internet groups, women are active and hold important positions, yet are seldom prominent,’ Angela Richter writes, in the introduction to the book. ‘This is not because women lack the assertiveness to occupy a role in the foreground, as is so often claimed with a certain paternalism.